For this exercise, the aim was to use line to “observe closely the crucial structural lines that outline shape and suggest volume and texture”. I began by drawing blind contour drawings, of which the first two are below. Kimon Nicolaides in his book, “The Natural Way to Draw”, describes a contour drawing as “like climbing a mountain as contrasted with flying over it in an airplane. It is not a quick glance at the mountain from far away, but a slow. painstaking climb over it step-by-step” (Nicolaides, p.11). Nicolaides said that we should allow our eyes to move at a slow, steady pace around the subject, keeping our eyes on the subject not the paper. I find that this requires an almost meditative, trance-like state to succeed and, therefore, only works in a relaxed state of mind without the “to do” list running through the back of my mind. I have adopted a method that I read about on Access Art (link here but it might require membership for full access) which essentially involves taking a piece of cardboard and make a hole in the centre for your pencil. The card should be slightly larger than your hand when in a drawing position. This makes it impossible to see what you are drawing and so it isn’t worth peeking! I find that this aids focus. It takes a bit of getting used to and it can help to tape the card into position so that it is not actually resting on your drawing hand. The drawings below (in an A3 sketchbook) were made in a relaxed state of mind using the cardboard. I began at the top of the plant each time and drew in a clockwise direction. This is clear in the drawing on the left in which I overshot the starting point. I found it difficult to maintain pressure – or perhaps it was due to changing the angle of drawing with this particular pen. I am very pleased with the one on the right, which was almost spot on. I then added some negative spaces and stalks to convey some sense of structure. Because the course notes refer to making “several studies” in this way, “spending only a few minutes on each one”, I thought that I should do more. This time, I chose a different angle, more directly above the plant and began on the left-hand side. 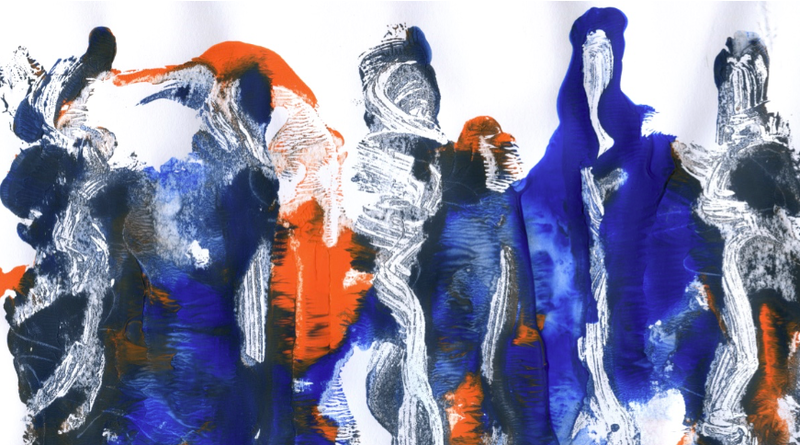 The blind contour drawings below were done a few days after the ones above and were done in less time and in a different mind set – and it shows! I have no doubt that this is something which should be part of daily drawing practice if skills are to develop but, for me, a blind contour drawing requires a slow, meditative approach if I am really to see the subtle changes in the edges. Plants and other natural materials, in particular, often have softer, more rounded edges which present particular challenges if the hand is to accurately follow the eye around them. Most of the drawings below have the same fault, however: I shifted too far over horizontally to the left towards the finish so that when I approached the starting point, there was not enough space. This is particularly apparent in the drawing on the far right and it seems to have become a worse problem with each attempt (4 drawings from left to right – the plant becomes skinnier each time! ), suggesting that I was trying to over-compensate in some way. I gave up at this point because of lack of focus. My next blind contour drawing was done in an A4 sketchbook. I attempted one flower only with an Inktense pencil and then played around with wash to add structure. As this was not the aim of the exercise, I had another go with an HB pencil. I overestimated the line at the top of the flower and then added detail in the form of connecting edges and further modified the lines using a light sepia conte pencil to try to get a better idea of the overall form. It is a mess but it has made me more aware of the top flower which leans back away from the viewer and this has different impacts on drawing, depending on the viewing angle. My last attempt at a pure contour drawing was done using Sketchbook Pro on an iPad. I couldn’t resist some structural special effects! I’m quite pleased with the flower at the bottom, as well as the overall contour although the contour is too defined and harsh for the more delicate flowers, which were not planned. Not sure why I didn’t add negative space – presumably there should be some from every angle in this plant. When I attempted a different angle, again I used the iPad, this time using Art Rage. This was the first time of using this particular app and I found that the pen colour tended to change randomly when I switched functions and was not easy to change back exactly. Therefore, this is a (at least) two-tone drawing, which I quite like and would be worth pursuing in a more controlled / planned way. I am beginning to get movement into the flowers. At this point, I thought that I should learn about the anatomy of an orchid, so that I would have a better understanding of the individual structures as well as their relationships to each other. The structure that opens out at the bottom is called the lip, and it is technically also a petal. The other petals are the two wide “wings” either side of the centre. The three narrower petal-like structures are actually sepals, whose job is to protect the flower in the developing bud. For the last couple of line drawings, at this stage, I decided to zoom in on the colourful internal structure which contains male and female parts of the flower (known as the column). Even with line alone there is more opportunity to convey structure and texture here because of the crimson striations which follow the undulating form of the column. I used a magnifying glass to get a closer look. This was not intended to be a botanical illustration, more of an investigation using line. It proved awkward because I have no way to set a magnifying glass into a permanent position in front of the flower, which meant that I was constantly bending forward to peer at it and then sitting back to draw. Here is the flower under the magnifying glass. This photograph was taken with one hand on the magnifying glass and the other trying to operate the camera on the phone so the angle is not exactly the same as that in the drawing which follows but it gives an idea of the subject. Here is the drawing that resulted. It is approximately half of an A4 sketchbook page. The internal markings create the first texture that I have consciously produced in this exercise. Because it seemed a bit cramped on the page, I repeated the exercise from a different angle in the A3 sketchbook. The scale is such that, if I wanted to reproduce it and include an entire flower, I would need to use at least A2 paper. This has implications for composition. Somewhat surprisingly, the scale of these drawings is not too different – it is the angle in the A3 drawing (the plant was on the floor with the flower slightly tilted upwards, compared with the plant standing on the coffee table and the flower more or less at eye level) which makes the flower appear larger. The level of detail is much the same. The angle creates a totally different feeling / mood – looking at the plant head on creates a more confrontational image, somehow (but it is only an orchid, not a triffid). Here are the two drawings photographed together. I have used lines to denote edges of planes where tone would be a better choice because of the nature of the exercise. I had to adjust the width of the stem because it did not look strong enough to support the flower. It should now be to scale. 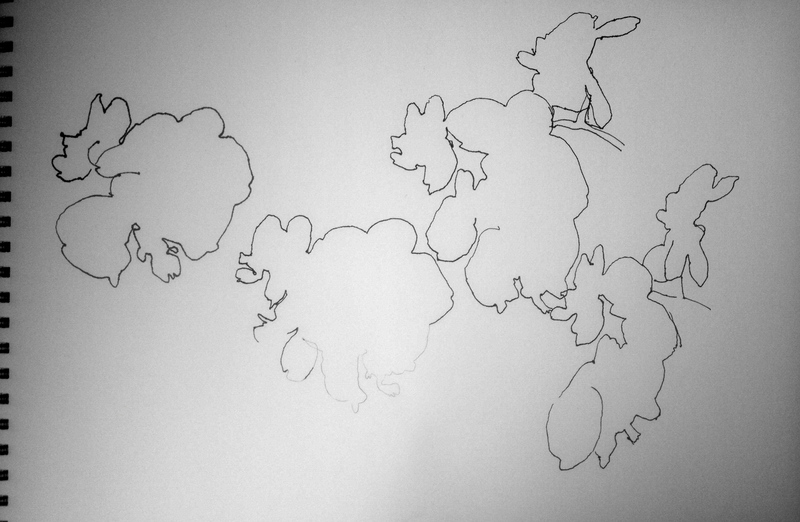 In none of these drawings in this exercise have I provided a context for the orchid (“rooted the plant”), which is partly because I have been focusing on the flowers but also partly because I have often used A4 paper and cannot achieve a desirable level of detail as well as the entire plant on this scale. Nicolaides, Kimon (1941) “The Natural Way to Draw”. Houghton Mifflin. Postscript: I remain concerned that the orchid will stay in the land of the living for the duration of this assessment. I have just signed up for a “watering reminder” on http://justaddiceorchids.com – apparently 3 ice cubes a week is all that is needed to keep an orchid alive. At the moment, I am giving it a 10 minute soak once a week. I have had it for two weeks and it still looks healthy, although now minus its buds….